British travelling photographer and publisher of continental views Francis Frith spent 6 weeks following the course of the River Rhine through Switzerland, Austria and Germany. His photographs illustrate scenes from Henry Wadsworth Longfellow's novel 'Hyperion,' in which Paul Flemming is the fictional hero. In the Artist's Preface of the book Frith writes: "Stuttgard is a beautiful city. 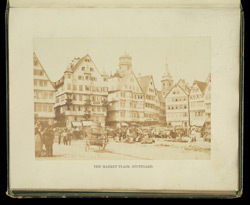 The market-place, surrounded by houses of picturesque designs and noble proportions, and for the most part from 300 to 500 years old, is unique. Had Flemming tavelled now-a-days, he would have gone to the splendid Hotel Marquhardt; but his reference to the 'old Gothic cathedral, with its narow lancet windows and jutting buttresses right opposite' his hotel windows, points clearly to the fine old building which we photographed. It is now called the 'Hotel Munk.'"